A groom to be dips his fiancé lovingly in front of the Centennial Park fountain in Chicago, Illinois for their engagement photo. Jeremiah and Brieanne brought it all to their recent engagement session in downtown Chicago. We needed to show off Fall leaves to blend with their wedding next September. As Indianapolis Colts fans, their devotion to their team also needed to be included. They also fell in love with some recent night time Chicago skyline images I had done as well as my Chicago Sessions Engagement Package that features all the images turned into vintage photographs, evoking old film from the late 1960's and 70's. So off we went on this brisk November day incorporating all the windy city has to offer. As is tradition with this session, we met at the South Shore train station with the train arriving to take our couple for their adventure. A couple in love kisses on the platform of the train station. I shoot these Chicago Session engagement photos in vivid color and then turn them into vintage looking black and white images afterward. Since this is only a sneak peek of last weekend's session, I'll mainly be showing the color versions today. The black and white versions will all be put into a book to tell the story of the day. However, the color versions will be available for the couple as well. 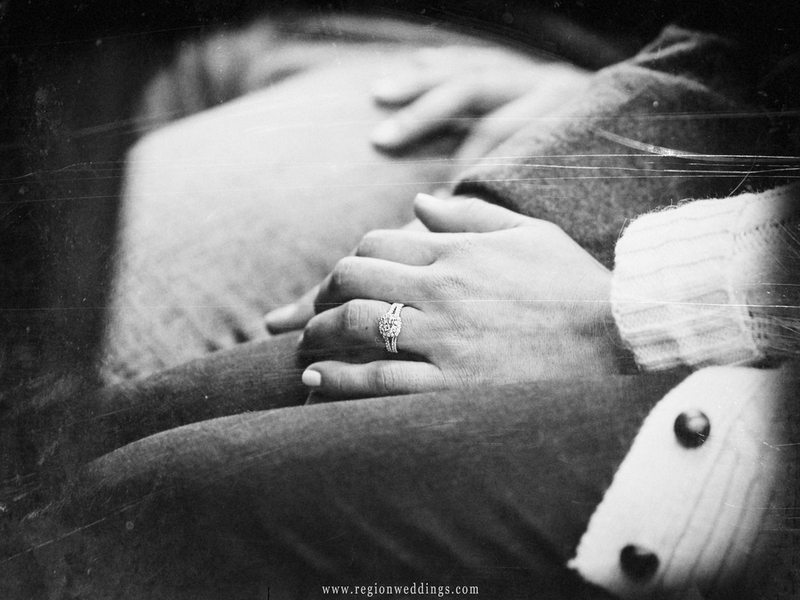 A couple clutches hands while taking the train into the city of Chicago for their engagement photo session. A couple in love shares a laugh on the South shore train going toward Chicago. I tried to keep my eyes peeled for any Chicago Bears fans who might want to pelt my clients with rocks as they showed off their Indianapolis Colts pride. I can see this image as a Save the Date photo for sure. An engaged couple writes their wedding date on a football while they kiss in the background wearing their Indianapolis Colts jerseys. A groom to be tackles his fiancé while playing football in the park in downtown Chicago. A couple smiles and embraces as they are surrounded by Fall color in the park in downtown Chicago. Love and football had now been accomplished, now it was time to capture some Fall color. We weren't sure what'd we get this late in November, but I think it worked out pretty good. Brieanne and Jeremiah were up for anything as they braved the winds and the steadily falling temperatures. A couple embraces as they take a rest during their Autumn engagement photo session in Chicago. A couple playfully looks at each from each side of a large tree in Millennium Park. I like to take a good amount of time when I do my Chicago engagement sessions, I do it because i really love it, but it also provides a great story for the album that is included. The city has a photo idea every ten feet it seems. We often take a coffee break and then onto another area. In this case, it was a terrace overlooking the skyscrapers of Chicago. We knew it was going to be cold at this point with nothing to shelter us from the winds off of the Lake Michigan. Brieanne and Jeremiah were very dedicated as I shot the scene a number of times to get the image just right. The blue Chicago skyline at dusk with a happily engaged couple sitting on the terrace of the Adler Planetarium at the Museum Campus on the lake. A couple embraces on the shores of Lake Michigan at night with the lighted Chicago skyline in the background. After night fell, we used the city lights as our backdrop for romantic shots of the couple together celebrating their upcoming marriage. It was a wonderful experience for me and one I think they will cherish forever. There will be many more images to come from this session. For updates, stay tuned here and the Region Weddings Facebook Page as well. A couple tenderly embraces as city lights blur behind them at night. A newly engaged couple smiles for the camera on the streets of Chicago at night.